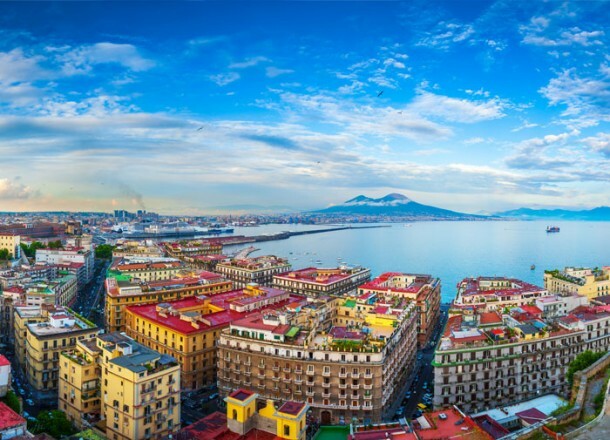 Following on in our series of articles on Italian street food (Street Food in Sicily and Street Food in Florence), it’s time to head to the Campania region, home to one of the most significant cities when it comes to scrumptious food: Naples! Ready, grab your forks…get set…go! Campania is a Southern region of Italy packed full of colour and life, where people seem to have a natural disposition to smile and don’t take life too seriously! It’s capital is also one of Italy’s Food Capitals with an abundance of incredible local specialities. 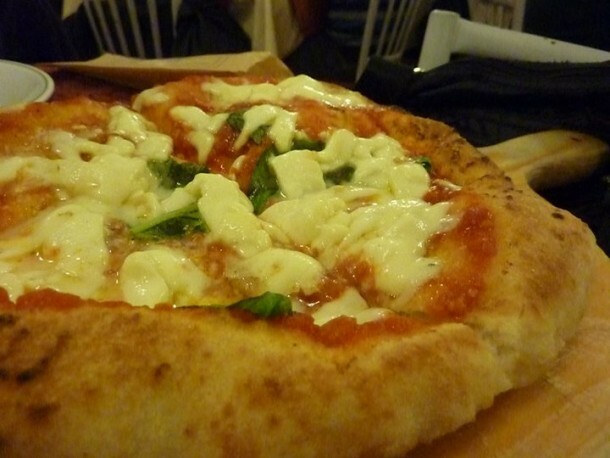 If regular pizza is Naples’s signature food par excellence, pizza fritta, which is a deep fried version of the dough base topped with tomato sauce, ricotta cheese and basil, is certainly the queen of street foods! It’s the perfect pizza to sell on the street as of course there’s no need for an oven! Frying the pizza base gives a crispy outside and a soft pillowy interior – althogether a different (and incredible) pizza experience. The best places to sample this delicious pizza are “La Masardona” on via Giulio Cesare Capaccio n.27, just a few steps from the Central Train Station, “Pizzeria De’ Figliole” on via Giudecca Vecchia n.39, in the heart of Naples’ historical center (Forcella), and “La Figlia del Presidente” on via del Grande Archivio, n.23/24 – famous for having served this delicacy to Bill Clinton! 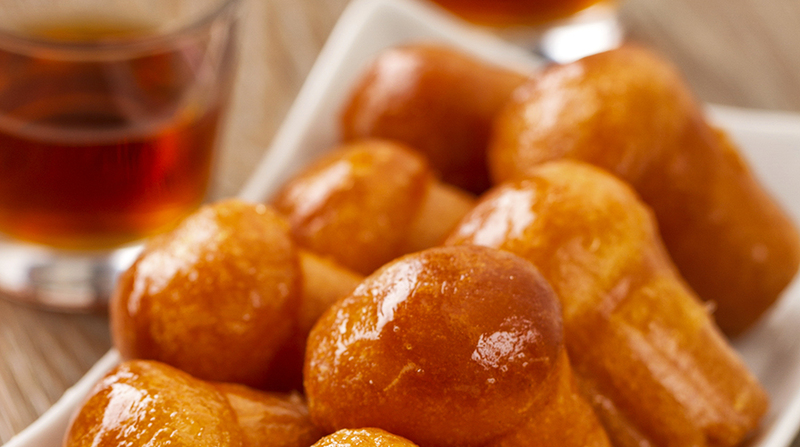 These special, airy dough balls are a savoury treat that will make your day. They are as simple as they looks but so delicious you will hardly be able to stop popping them into your mouth! The name ‘Pasta Cresciuta’ literally means risen dough and a full bag will cost you peanuts! Try this tasty snack at “Friggitoria Fiorenzano” on via Pignasecca n.48 or at “Antica Friggitoria Spaccanapoli” on via Benedetto Croce 42 and you will be not disappointed!! Fried goodness is lurking on every corner in beautiful Napoli and you can choose from some luscious alternatives. Palle di Riso is the Neapolitan version of ‘Arancine’ – fried rice-balls stuffed with meat, peas and carrots. 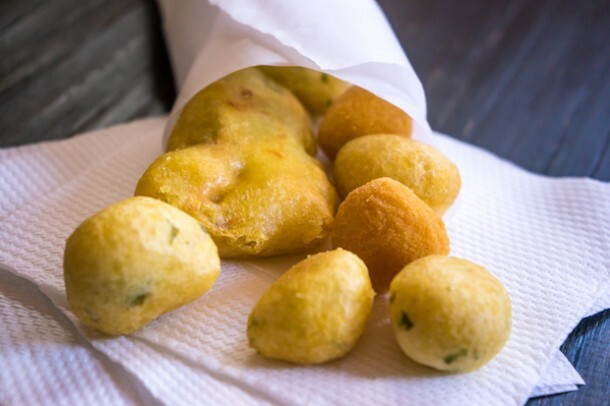 Polenta Fritta are fried polenta triangles, salty and satisfying while Crocchè (also called Panzerotti) are the best potatoes croquettes you will ever taste, made up of a flavourful mash, seasoned with parsley, salt, pepper and cheese and rolled in bread crumbs before being deep-fried. Heaven in a bite! The best places to try these fried delights are the two indicated above (same places as the Pasta Cresciuta) and also the “Friggitoria Vomero” on via Domenico Cimarosa 44. Italians love pasta and adore fried foods and that is the reason why in Campania they fry leftover pasta! Bucatini are just perfect for this and, after seasoning them with creamy sauce made of minced meat, peas onions and carrots, this dish is fried into mini-portions… delightful! As we have seen, fried street food is abundant in this region as is wonderfully fresh fish. This street speciality combines the two and is served in a brown paper cone, twisted and filled to the top with fresh fried fish! The fish most commonly used are anchovies and cod but you can also find the currea, a long flat fish that looks like a belt. Super yummy! You can try the Cuoppo in any friggitoria around the town but maybe the best one is prepared by “Il Cuoppo Friggitori Napoletani” on Via San Biagio Dei Librai n. 23. The sweet side of street food can be surprising in Campania. You will have a great selection of traditional sweets just smaller in size. Babbà is the typical Neapolitan cake, made of dough that is fluffy and airy and soaked in rum. Sfogliatella is another typical pastry, which can be made in two different versions: frolla, which is a smooth pie-type dough and riccia, which instead is more like a filo-pastry kind of dough. Both are filled with a ricotta cheese sweet cream. Finally we have Graffe, which are the Italian version of doughnuts with a slightly different type of dough and no icing but just sprinkled sugar on top. So many cakes so little time! The best Babbà and Sfoglatelle in town? There are at least 20 great quality “pasticcerie” in Naples so you will be spoit for choice but our favourites are: “La Sfogliatella Mary” Galleria Umberto I, Via Toledo 66, “Pasticceria Tizzano” on Corso Meridionale 16 and “Patisserie S. Capparelli” on Via dei Tribunali 327. 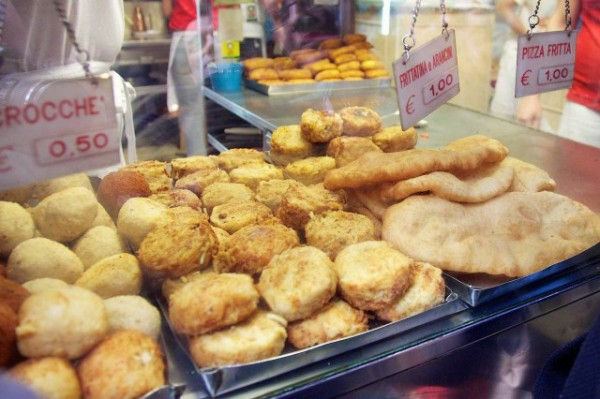 Enjoy your trip in Naples and forget your diet! !